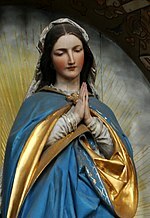 Ave maris stella (Latin for "Hail Star of the Sea") is a plainsong Vespers hymn to Mary from about the eighth century. It was especially popular in the Middle Ages and has been used by many composers as the basis of other compositions. The creation of the original hymn has been attributed to several people, including Bernard of Clairvaux (12th century), Saint Venantius Fortunatus (6th century) and Hermannus Contractus (11th century). The text is found in 9th-century manuscripts, kept in Vienna and in the Abbey of Saint Gall. Its frequent occurrence in the Divine Office made it popular in the Middle Ages, many other hymns being founded upon it. The "Ave maris stella" was highly influential in presenting Mary as a merciful and loving Mother. "Much of its charm is due to its simplicity". The title, "Star of the Sea" is one of the oldest and most widespread titles applied to Mary. The hymn is frequently used as a prayer for safe-conduct for travelers. The melody is found in the Irish plainsong "Gabhaim Molta Bríde", a piece in praise of St. Bridget. The popular modern hymn Hail Queen of Heaven, the Ocean Star, is loosely based on this plainsong original. Transforming the name of "Eva" (Eve). The plainchant hymn has been developed by many composers from pre-baroque to the present day. The Roman Rite employs four different plainchant tunes for the Ave maris stella; the first three are designated for solemnities, feasts, and memorials of the Blessed Virgin Mary; a fourth is given in the Little Office of the Blessed Virgin Mary as an alternative to the memorial tone. These plainchant tones have been used as the cantus firmus for some polyphonic settings of the mass, including those by Josquin and Victoria. Renaissance settings include those by Hans Leo Hassler, Felice Anerio, Giovanni Pierluigi da Palestrina, Dufay and Byrd. Baroque settings include Monteverdi's Vespro della Beata Vergine 1610 and one by Emperor Leopold I. Romantic settings include those by Dvorak, Grieg, and Liszt. Modern composers who have either set the text or used the hymn as an inspiration include Marcel Dupré, Grace Williams, Peter Maxwell Davies, Otto Olsson, Trond Kverno, Jean Langlais, Mark Alburger, and Andrew Cusworth. Ave Maris Stella is the anthem of the Acadians, a francophone community in the Canadian Maritimes distinct from the French-Canadians of Quebec. The Acadians were highly devout, and had and still have a high degree of devotion to the Virgin Mary. As such, Acadia's symbols reflect its people's beliefs. This is particularly evident in their anthem which instead of being written in French is written in Latin. It was adopted as the anthem of the Acadian people at the Second Acadian National Convention, held in Miscouche, Prince Edward Island in 1884. To this day, it remains a source of Acadian patriotism. The hymn was sung in its original version until French lyrics were finally composed in 1988. The French lyrics are attributed to Jacinthe Laforest, from Mont-Carmel, Prince Edward Island, who submitted her lyrics during a contest held throughout the Maritimes by the Société nationale de l'Acadie in search of French lyrics. Out of respect for the original hymn, the first verse in the Acadian national anthem remains in Latin. These are the lyrics, in French. The first verse is in Latin, and is repeated at the end of the hymn. ^ a b Herbermann, Charles, ed. (1913). "Ave Maris Stella" . Catholic Encyclopedia. New York: Robert Appleton Company. ^ Cod. Vindob. 387, fol. 2v, a Carolingian ms. of De ordine ac positione stellarum in signis dated to 818; facsimile at the Warburg Institute Iconographic Database. ^ a b Liber Hymnarius, Solesmes, 1983. ^ Thus in the original, see Te Decet Hymnus, Typis Polyglottis Vaticanis, 1984, p. 255 and Liber Hymnarius, Solesmes, 1983; Pope Urban VIII's 17th-century revision has preces here. ^ Thus in Liber Hymnarius, Solesmes, 1983. Pope Urban VIII's text has Spiritui Sancto, Tribus honor unus. ^ The word "Hail" in Latin [Ave] is the reverse spelling of the Latin for "Eve" [Eva]. Wikimedia Commons has media related to Ave maris stella.